With the growing inclination towards mobile, and mobile applications in particular, there is a pressing demand in front of charities to adopt this utterly popular engagement platform. A well-conceived mobile strategy is helping nonprofits to extend their reach and online donation worth. Out of every 10 mobile users, 8 run Android. 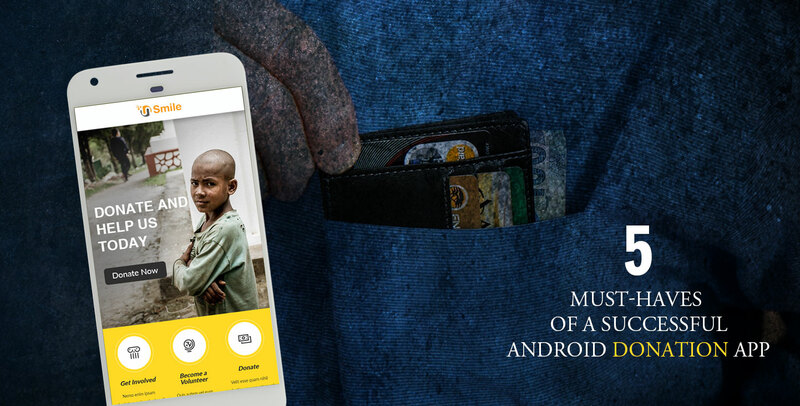 So, if citing the solid grip of Android on the marketplace, if you are planning to strengthen your online donation strategy with an Android donation app, you are on the right way. However, considering that users love app, it doesn’t mean that they will accept anything that you have. Here is a list of five must-haves of a donation app that deserve an attention of your Android app developers. Android users are scattered by device types or screen-sizes, and also to a greater extent by Android operating system versions. So, the UI of your Android donation app must respond to this diversity. All of your targeted audiences, including, volunteers or donors, irrespective of the Android device they run, must be able to access the app and perform the intended action without any delay. Isn’t the concept of responsive website development getting replicated in the context of Android app design, and later in development? Recommended by Google, FAB is an integral part of Material Design that makes the user interface of a built application quite interactive. FABs can be used to highlight important buttons like DONATE, SUBMIT, GO, etc. Doing so, you ease the user-journey through your donation app, and achieve a higher degree of user-engagement and conversion. However, the choice of FAB color and size of its icons holds subtle significance. An dilemmatic situation must be skipped. A big chunk of first-time app users are quite impatient. Failing to explore your fundraising app thoroughly and quickly, many potential donors out of them might uninstall your app or just quit it. Hence, it makes sense to invest in crafting a simple navigation path for them. The simplicity of the design must complement with the agility of the application. However, this is easier said than done. The entire UI design, Android app development, and testing processes must be drawn out under a robust DevOps methodology. Whether you are seeking donation through monetary transactions, selling out some merchandise, or offering a paid-membership, it should be utterly simple for users to get involved into. Enable donors to make payment conveniently using a credit or debit card that they possess. Also, the handling of a donor’s information and subsequent payment should be done safely and precisely. The integration of Firebase Dynamic Links with the donation app can help you reach more volunteers or donors. This is an incredible way to seek the opinion or favor of existing donors or satisfied app users. The feature allows them to recommend the app to their friends over SMS or email. The moment, the recipients will click on the received message or link, they will be routed to the Android app distribution platform, i.e., Google Play, or anywhere as per the intention of the app owner.